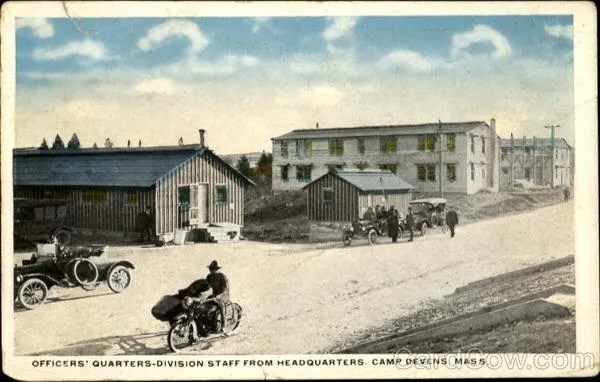 Named after Union General and Judge Charles Devens of the Civil War, Camp Devens was established in 1917 as the primary National Army cantonment (training center) for the Northeast Military Department. 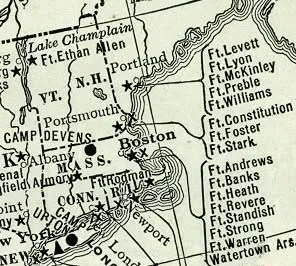 Built on a tract 7 miles long by 2 miles wide, Camp Devens covered 5000 acres of land along the Boston and Maine railway obtained from the contiguous communities of Ayer, Harvard, Shirley and Lancaster, Massachusetts. Construction started in early June, 1917, and was performed by a labor force of 5,000 workers which in just 10 weeks built a small city consisting of 1400 buildings, 20 miles of road, 400 miles of electric wiring and 60 miles of heating pipes in addition to water and sewer service. Due to the speed of its development, Camp Devens formally opened at the beginning of September, 1917. It was the first of 16 National Army cantonments to be completed in the country, processing and training more than 100,000 soldiers of the 76th and 12th Divisions from 1917-1919. The 12th Division did not serve overseas, but did its own battle with the Spanish Flu epidemic during the Fall of 1918 and sustained heavy casualties: Approximately 14,000 men were hospitalized with influenza and pneumonia. Of these, more than 2,278 died including five nurses and two doctors. 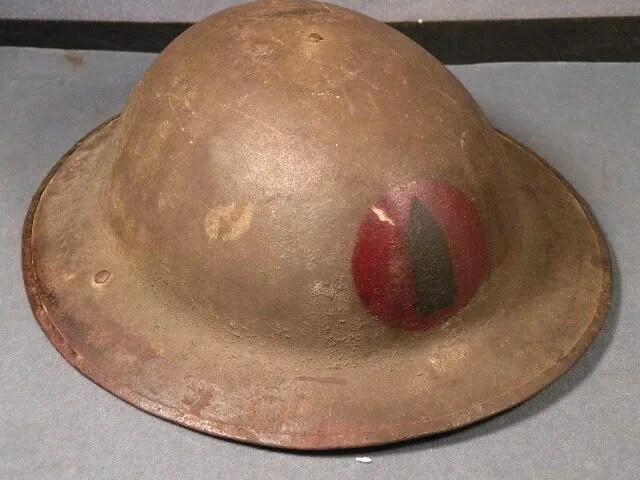 Following the Armistice in November of 1918, Camp Devens became the separation center or “demobilization camp” for more than 150,000 troops returning from France including the 26th “Yankee” Division in April, 1919. Camp Devens was then placed on inactive status, serving as a summer training area for National Guard and Army Reserve troops over the next several years. Passage of the National Defense Act of 1920 provided funds for upgrading the facilities of Camp Devens as a permanent military installation. 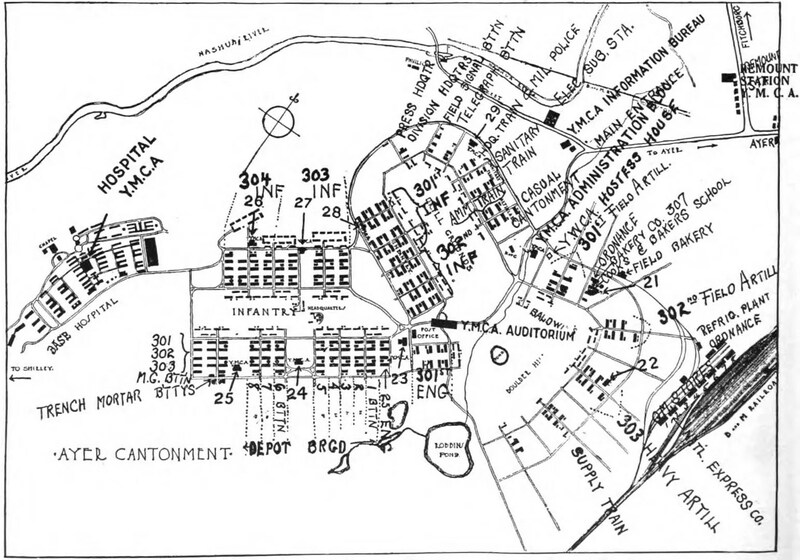 In 1931, Camp Devens was renamed Fort Devens. Reconstruction continued at a slow pace during the 1930’s as a project of the Works Progress Administration. Today, the Fort Devens Historic District provides a well-preserved example of U.S. Army post planning and standardized building construction between 1929 and 1940. The 103 buildings surviving from this period are currently on the National Register of Historic Districts. In 1940 following the implementation of the first peacetime draft, Fort Devens was designated as the reception center for all New England troops. An additional building project was started which constructed more than 1200 wooden buildings and an airfield. The 1st, 32nd and 45th Infantry Divisions along with the 4th Women’s Army Corps all trained at Fort Devens during the Second World War. Additionally, Fort Devens provided training support for nurses, chaplains, cooks and bakers. It also housed a prisoner of war camp for German and Italian prisoners from 1944-1946. After serving once more as a demobilization center following the Second World War, Fort Devens was again placed on reserve status until the start of the Korean War. For the next forty years, Fort Devens continued to serve as the training center for many smaller units sent into action overseas during the Korean, Vietnam and First Gulf Wars. After 79 years of service, Fort Devens was closed in 1996 under the National Base Realignment and Closing Act. It is now evolving into a planned residential and business community renamed Devens under the authority of MassDevelopment. Although no longer an active military installation, Devens is still home to elements of the Army Reserve Command (94th Regional Readiness Command) and the Marine Corps Reserve (25th Marine Regiment). My grandfather was in the 303rd Machine Gun Battalion at Camp Devens, deployed to France. Would love to know if a picture of his battalion exists somewhere! I have a photo of company H 304th regiment infantry national army camp devens 1917. I’m looking for some information on who might be in the photo. I found it in the attic of our fire house in North Canaan Ct. I have a Co.G 303rd Infantry Camp Devens Mass July 1918 photo. There are probably 200 men in the photo. I assume the photo belonged to my grandfather . Can anyone tell more about the photo and what can I do with it. My grandfather served in the 301st Field Artillery Regiment, Battery F. His war diary mentions arriving at Camp Devens then deploying to France. I have his Battery photo at Devens as well as his helmet, gas mask and related items. Great site! I have a photograph of Co. A 12th MP Camp Devens Mass Oct 1918. The original is in poor shape but I have had a copy restored. I am looking for information regarding the identity of the soldiers in the photograph as I am looking to determine which is my great grandfather George Fernald. Thanks for any help. I have a 47″ x 7″ panoramic pic of Company A…33rd Engineers…Camp Devens, Mass. dated April 23, 1918. Photo by G.W. Lovell with Falk Photo C., Boston. It is in excellent condition (however a bit faded) and was hanging in the upstairs of the Minneapolis house I bought in 1997. I am looking for information about this pic and it’s worth. III HAVE A PANORAMIC PICTURE OF COMPANY D. 303. MCB AYERS, MA 6/ JUNE 25 1918 I AM LOOKING FOR THE NAMES OF THE SOLDIERS IN THIS PICTURE TO SEE IF ANY RELATION TO ME, THIS WAS FOUND IN MY GRANDMOTHER’S ATTIC. I have a 3 foot long photo labeled “Co. 1. 304th Regt. Infantry National Army…Camp Devens, Ayers Mass…1917”. There is some water damage and torn edges, the the body of the picture is good. If anyone has a family member who served in that unit I’d love to hear from you. My Uncle was in Comp L 325 infantry 82 division. I was wondering if anyone might have a picture they would like to share. 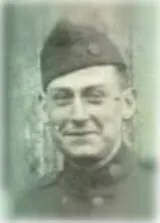 My father was in the 301st Field Artillery Regiment that served in France during WWI. Leverett Saltonstall, later a senator, was his commanding officer. I have two pictures of him in army uniform. Would like to communicate with anyone with pictures or info about this group. Thanks. We just found a panoramic framed picture of about 100 men in a house that we were cleaning out in Susquehanna County Pa. inscribed “Co. 12 Depot Brigade overflow 5-15-18 Camp Devens” Does anyone have a connection to this? I have a banner with a red and blue diagonal back ground with white edging. It says Field Artillery 303 1917 Camp Devens. It has crossed cannons in the middle. Would like to know something about this. I also have two pictures of my Grandfather in uniform. I am wondering if someone can help me my great grandpa was in the 12th Supply TN in the 151 depot brigade and I was wondering if anyone knows anything about his unit because I have searched and never found him. I have a complete 302E sargents uniform. Any idea how I could find out how it belonged to? Unless you have identifying information in one of the pockets, linings or identity tags as part of the ensemble, there probably isn’t anything that would reveal the original owner. Does anyone have a photograph of the members of Field Artillery Regiment 301, during WWI? My father served in that Regiment and was stationed in France. For Vin DeSomma: My father served in Field Artillery Regiment 301, too. Do you have pictures of the members? He served in France, too. I have a notification to my grandfather in Worcester that informed him of the arriva, overseas,l of Vitalis Johnson of the 302nd Ammunition Train. it was sent by Captain E. W. Hamlen Q.M.R.C. I am searching for more information to confirm that VItalis was in WWI and was sent from Fort Devens. I have a large picture in my closet that I purchased years ago. The framed picture (46″ x 9″) is of G Co 42nd Inf. Camp Devens, Mass 1918. Photo by Snow & McDermitt, Wilbur, Mass. Anyone interested in having it? re: Mike Guthrie (jmg18@yaooo.com) and others.. I was recently given a framed photo of the 151st D.B. (Depot Brigade), taken at Devens, Mass. 1918. I believe my friend found it in a local antique shop. It’s a 36″ long framed company photo. The markings are faded and no soldier names are listed, but feel free to email me (hermdaniel@yahoo.com) and I’ll send you a copy so you can see for yourself..